My go-to earrings this fall are the Gold Vista Earrings from Purpose Jewelry's new Premier Collection. These beauties take on a unique shape and reflect the light just right in order to compliment any fall colors you are wearing. I love the light weight of these earrings and the sleek design. Purpose Jewelry is hand crafted by survivors of human trafficking, donating 100% of proceeds go to International Sanctuary benefiting girls and women escaping human trafficking. The new Premier Collection is Hypoallergenic plated in 14k Gold or Rhodium and comes in a gorgeous box, perfect for holiday gifting! Be sure to check out Purpose Jewelry's Pre-Black Friday sales which start tomorrow! Details listed below!! Pre-Black Friday Offer: (11/21 - 11/22) Get 20% off any order when you shop online. Use code "20OFF" at checkout. Black Friday Offer: (11/24 - 11/26) Get free shipping on any order and the first 75 get a free ornament too. 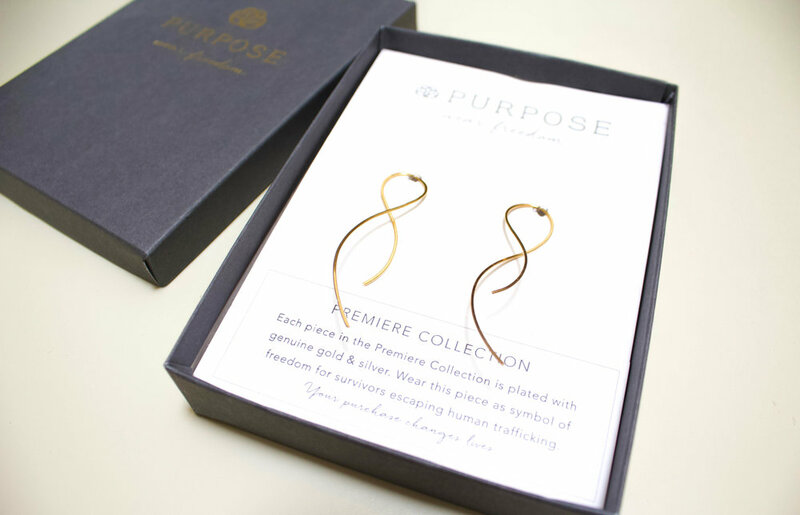 Use code "FRIDAY17" at checkout when you shop Purpose Jewelry. Cyber Monday Offer: (11/27) Get a FREE Shakti Anniversary Necklace with any order of $100 or more.